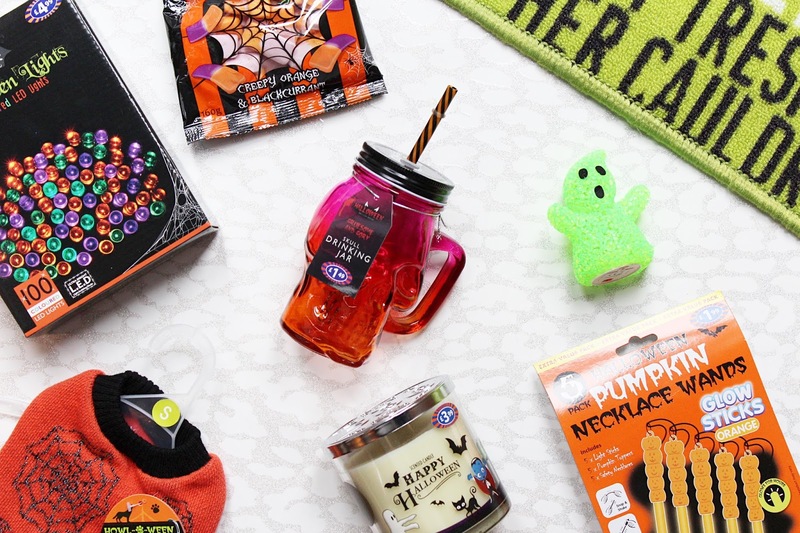 I love Halloween (or any excuse to decorate the house and get festive really) and B&M is one of my favourite places to shop for homeware and other goodies! I went into my local store and picked out some of my top picks from the Halloween section, they had so much more good stuff too! B&M is super affordable and this whole lot of stuff cost me around £20, you can't beat that! 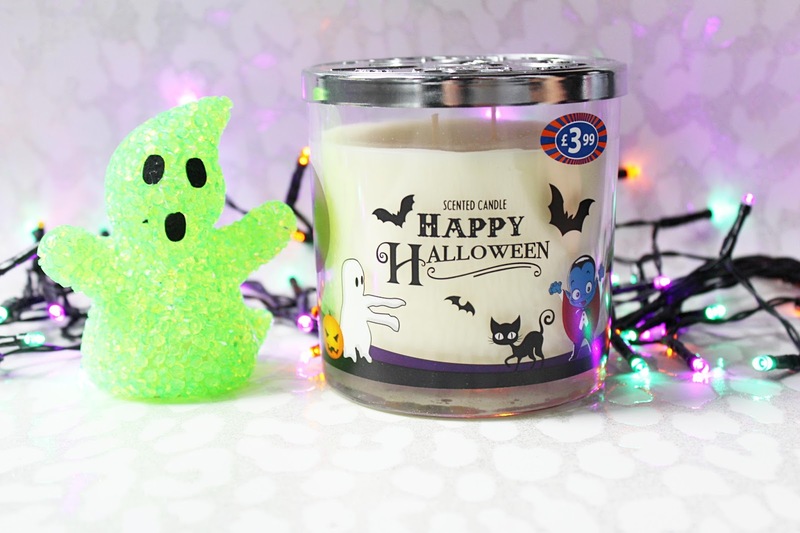 The first thing I knew I had to pick up was one of the Happy Halloween Scented Candles (£3.99). I had seen these all over Instagram so I knew I had to get one! I love the design of it, it looks very similar to a Bath & Body Works candle which in the UK would set you back around £20 for just one. It has a wrap around Halloween design sticker on the jar with great attention to detail on the lid, it has embossed skulls and 'BOO' on it. This has a really nice scent to it as well that you can use after Halloween has been and gone, it has notes of Vanilla and Cinnamon to me and has a great scent throw. I was actually surprised how well the scent kicked off when I was burning it! A total bargain for £3.99 and I hope they bring out some Christmas ones soon. I love fairy lights and have so many throughout the house, especially for the Winter months and I saw a pack of Halloween LED Lights for £4.99 and I had to have them. It's a pack of 100 so its great value for money and I love the colours used as even though they have been designed for Halloween, you can definitely use them in the next couple of months too! I really like that these are battery operated (they take AA batteries) as you can use them anywhere without having to worry about having a plug nearby. They feature gorgeous bright colours of purple, green and orange, I have mine in my front window already! Another light up item I picked up was a little Mini Glowing Ghost for £1. He was just so cute sitting on the shelf, all lonely that I had to bring him home and sit him by my iMac! He is actually really bright in the dark so would make a cute little night light for any young ones too. I have two bunnies and I am forever sad that I can never find any outfits for them so when I saw Halloween Jumper for £2.99 I had to have it! It's not actually for rabbits but it looked the perfect size for them and like something that would actually stay on them when they run around, keep an eye on my Instagram for a photo of Bailey wearing this soon, Buttons won't sit still long enough to let me put it on her! They had a few different ones available too and I even spotted some Christmas ones so you know I will be heading back to B&M to get one of those. 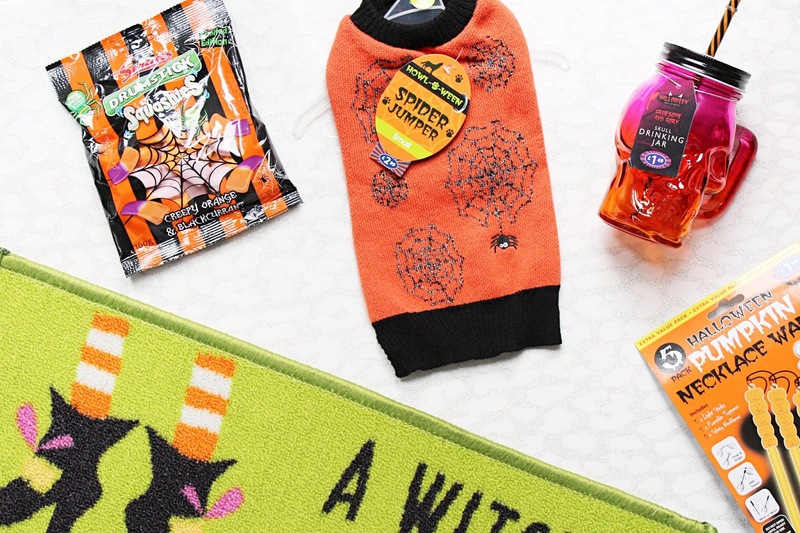 The next product I picked out was the Halloween Witch Doormat for £2.49. They had a few different ones to chose from but I liked the green one the best. It looks perfect by my back door but I will definitely be moving to the front on Halloween for all to see! The last few things I picked up were all for a bit of fun! The first item a pack of Pumpkin Glow Stick Necklace Wands which were £1.99. I have an idea of using these around my house for Halloween, maybe in my front window with the LED Lights so hopefully, it looks as good as it goes in my mind! If not, a few lucky kids will be getting these when they Trick Or Treat. I am obsessed with cups and mugs, I own far too many but one more isn't going to hurt, right?! I went for the Skull Drinking Jar (£1.49) and it's actually pretty big which I like as I am always finishing my drinks far too quickly. Again, this is another item that isn't something you can strictly use just for Halloween but it's cute and festive for the 31st! I love sweets and I hadn't seen these Squashies (Creepy Orange & Blackcurrant flavour) anywhere else so they went straight in my basket! These were only 89p and absolutely delicious. I was gifted vouchers to buy these items from B&M, all opinions are my own.